In what is arguably the best win since the move to Santa Clara, the 49ers defeated the Seattle Seahawks 26-23 in an overtime thriller, their first win against Seattle exactly five years and eight days from their last win against the Seahawks in December 2013. The Seahawks had won the previous 10 contests until Sunday. The 2018 season has not been without its drama though, with Bay Area blogger prognostications that head coach Kyle Shanahan would, or should, be on the hot seat. The criticism is unwarranted and quite frankly, ridiculous to even suggest at this point. The 49ers' lack of execution on offense is not the result of their head coach, it just reflects the general lack of talent at key positions like wide receiver and quarterback, and relying on an injured running back. To be absolutely fair to quarterback Nick Mullens and running back Matt Breida, they have been bright spots this season and have done a fantastic job overall filling in for the starters. But Mullens will at the very least go back to being a back-up quarterback for a while and Matt Breida will likely relinquish primary running back duties back to Jerick McKinnon next fall. Despite all this, the 49ers are now 5-10 in games decided by one score or less in Shanahan's tenure, 15 games out of 30 overall where the 49ers have been competitive enough to win but didn't due to a lack of execution on both side of the ball. 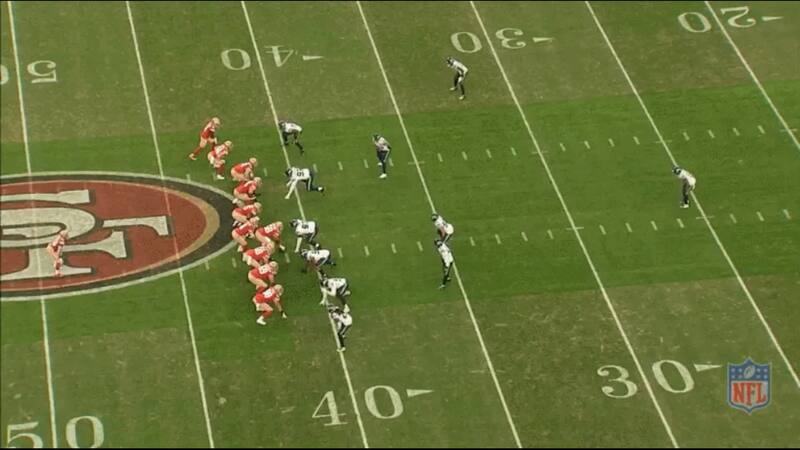 In those games, it's literally the difference of about two or three plays that don't go the Niners' way. The last two weeks however, the offense has, not flawlessly, but expertly executed the game plan. Shanahan is not without his faults, and there is a good list of things that need to change going into next season, but one thing is clear: he is one of the NFL's best young minds, perhaps one of the best among all offensive coaches period. Against the Seahawks, his brilliant strategy was on display, as he seemingly stayed one step ahead of the opposing coaching staff. On the first play of the drive to start the second quarter against Seattle, Shanahan uncovered a Seahawks tendency he would later exploit. In a two tight end, two running back pistol formation, the 49ers run a zone read with a fly motion to freeze the interior of the defense. The fly motion man, Dante Pettis (No. 18), goes in motion with only a single defender chasing, revealing man coverage. The fly motion also holds the defensive end in place so Mullens hands off to running back Matt Breida up the middle for a gain of only three yards. But sending a receiver on a fly motion could've been costly for the Seahawks as they were in man coverage, something Pettis could've easily beaten around the edge. 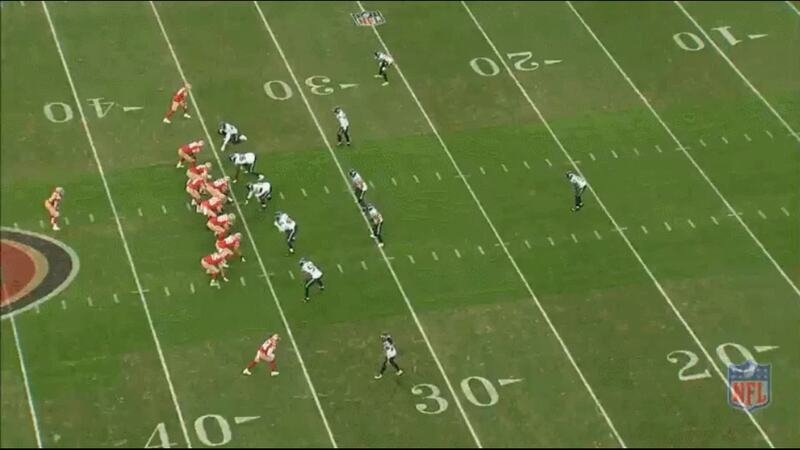 Earlier in the first quarter, they sent Goodwin on a fly sweep and no one covered him on the handoff up the middle. This time Seattle countered with one defender on the fly. Later, Shanahan would catch the Seahawks off guard with the fly motion, but first, we need to take a look at how he set them up in other ways on this drive. The Seahawks took a big gamble by not doubling tight end George Kittle to start the game, and it almost cost them two huge plays down field, one that would've went for a big gain down the left side line in the first quarter and one that would've likely been a touchdown in the second quarter had Mullens not overthrown him each time. 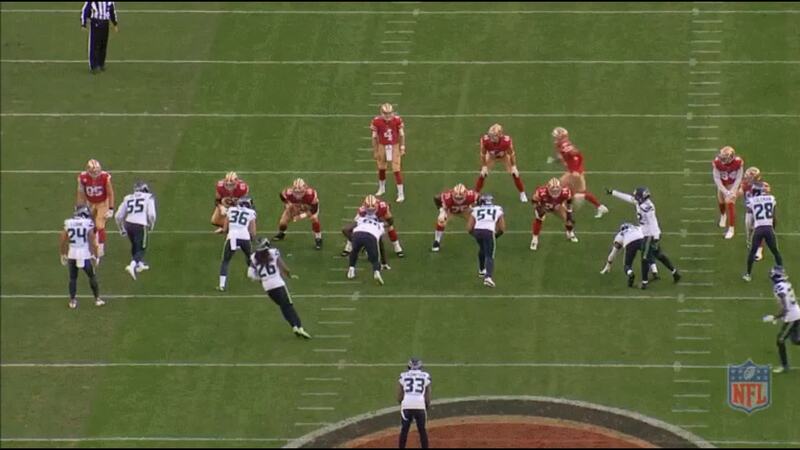 On the second overthrow, the Seahawks are in a "cover 6 skate" shell with WILL linebacker Austin Calitro (No. 58) who has responsibility to defend any crosser from the number three receiver (Kittle) or to drop into a weak hook zone if number three doesn't cross. Free safety Tedric Thompson (No. 33) is to the field side playing the deep third over the trips. Kittle gets a free release and gets behind Calitro by about two yards while Thompson struggles to get over the top because of his primary responsibility. Against cover-3 mable or cover-6 skate, the weak side corner in man-to-man coverage is usually always occupied by a shorter crossing route and is prevented from sinking underneath the deeper route to his side, leaving Calitro alone on an island. The Seahawks escaped a big play as Mullens sails the pass about five yards in front of Kittle. After that second overthrow, the Seahawks paid a bit more attention to Kittle on the drive. 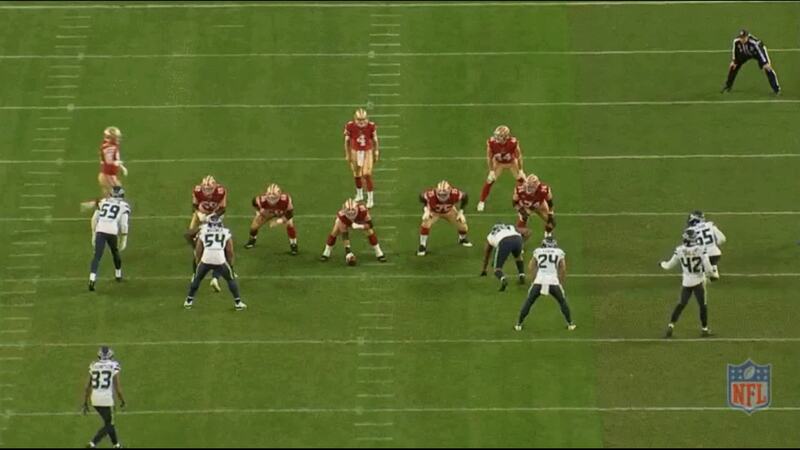 When they did, it opened up other areas for Shanahan to exploit. A few plays later on the same drive, the Seahawks made up for the error in leaving Kittle one-on-one. Except that it didn't help. Out of 11 personnel in a condensed two-by-two stack, the 49ers are running to outside verticals with two underneath crossers. Receiver Dante Pettis (No. 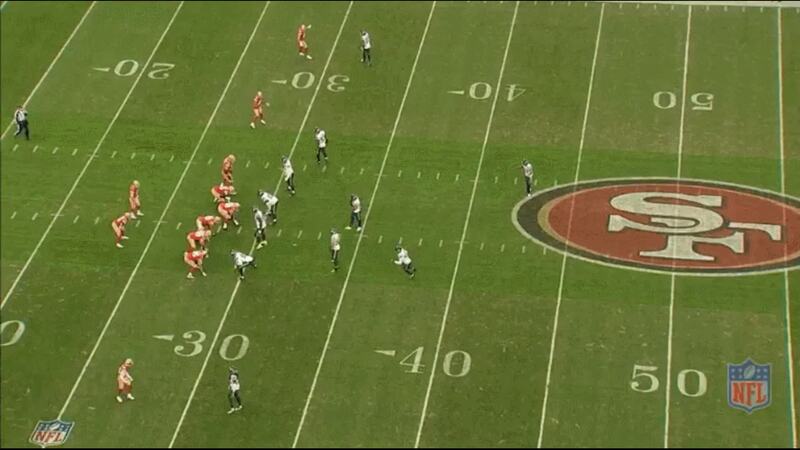 18) is stacked with Kittle to the right after Pettis motions over out of a trips bunch. At the snap, the Seahawks send a seven man blitz with the free rusher off the left edge of the 49ers offensive line, leaving the defensive backs in man coverage. Mullens takes the snap and avoids the blitz (more on that below) and looks at the safety, keeping him in the middle of the field with an eye on Kittle. Pettis angled out and up down the sideline and Mullens beats the coverage with a throw to a wide open Pettis, as no one covers him. On the very next play, the Seahawks bracketed Kittle but backed off their pressure package to keep defenders down field to cover. Out of 22 personnel (two running backs, two tight ends, one receiver) the 49ers line up in a double tight end formation. Mullens motions receiver Marquise Goodwin (No. 11) on a fly motion. The fly motion pulls the linebackers forward toward the line of scrimmage at the snap and tight end Garrett Celek gets a free release down the seam. On the other side, Kittle releases down the seam but is bracketed underneath and over the top by the corner and safety. The linebackers over Celek never recover from the fly motion and with Kittle occupying the attention of the deep safety Thompson, Mullens drops in a pass down the seam to Celek. Thompson goes for the tackle and stumbles to the turf as he approaches Celek. 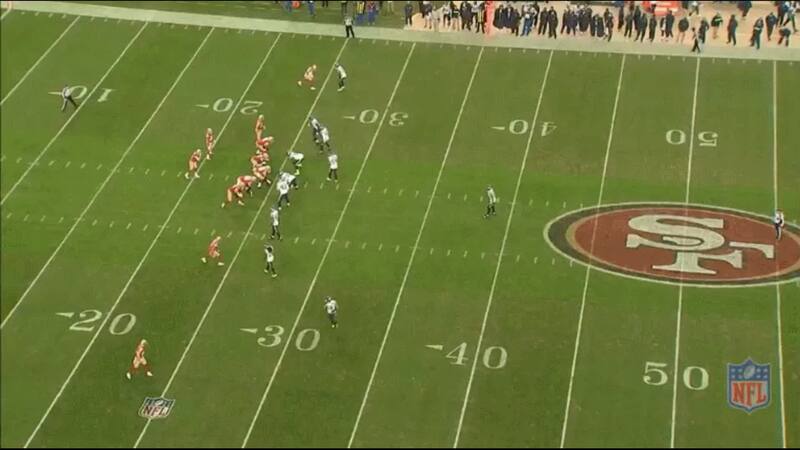 Celek runs free and untouched down the seam for a touchdown. Later on the next drive in the second quarter, the 49ers used that fly motion again to take advantage of the Kittle double teams by sending Kittle on a fly motion. Kittle motions out to the left and then Mullens sends him back on a fly motion, revealing to the offense that the Seahawks are in a zone coverage shell. As Mullens executes a hard play fake to Breida, two defenders flow downhill toward Kittle. On the right side of the formation, the fly motion allows Celek to get a free release down the seam on a corner route underneath the deep post ("scissors"), where Mullens hits him in the zone vacated by the underneath linebackers for a 20 yard gain. Is Nick Mullens the real deal? In his first start against the Raiders, Nick Mullens had fans calling for him to replace CJ Beathard as the back-up quarterback, with some even going so far as to argue for the starting role over Jimmy Garoppolo next season. While that's a bit premature, it's worth reconsidering what the 49ers have in Mullens since his progression as a passer has been quite impressive. Under pressure, Nick Mullens is currently the best 49ers quarterback this season. He's 32-64, 398 yards, one touchdown, two interceptions, is accurate on 72.9% of his passes and has a quarterback rating of 61.8, according to Pro Football Focus. One reason Mullens does so well under pressure, or at least better than C.J. Beathard and Jimmy Garoppolo, is that he is able to sense where the pressure is coming from and has an awareness to know where his receivers are at every stage in the down. From one of the plays above, the pass down the sideline to Pettis on the touchdown drive, Mullens faced an all-out blitz from seven Seahawks defenders. The 49ers only had six in pass protection, so that meant that Mullens is responsible for dealing with the free defender, safety Delano Hill (No. 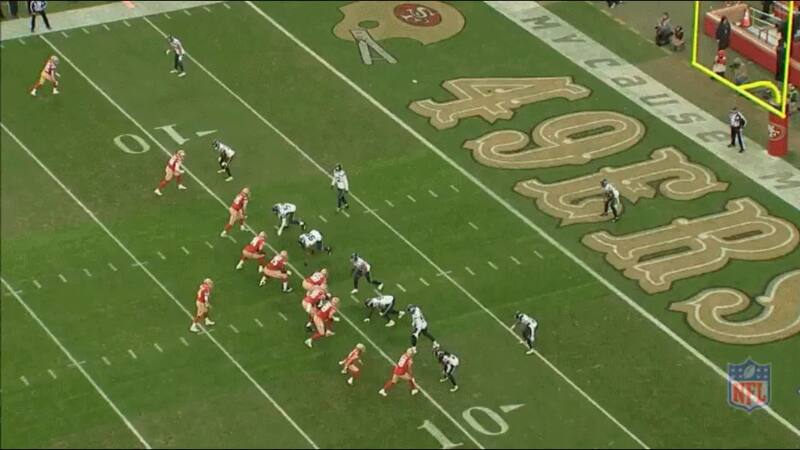 42), since there is no opportunity to slide the protection over to pick up the extra rusher. Mullens had Trent Taylor (No. 81) underneath as his hot receiver (receiver who runs free and uncovered because his defender blitzed) but looked off the throw when he felt the rush by Bobby Wagner (No. 54) up the middle. He sensed the free rusher, Hill, at that point and scrambled to his right and found Pettis for a gain of 24 down the right sideline. He was able to give himself time to get a throw off by shifting to the right before taking a hit. 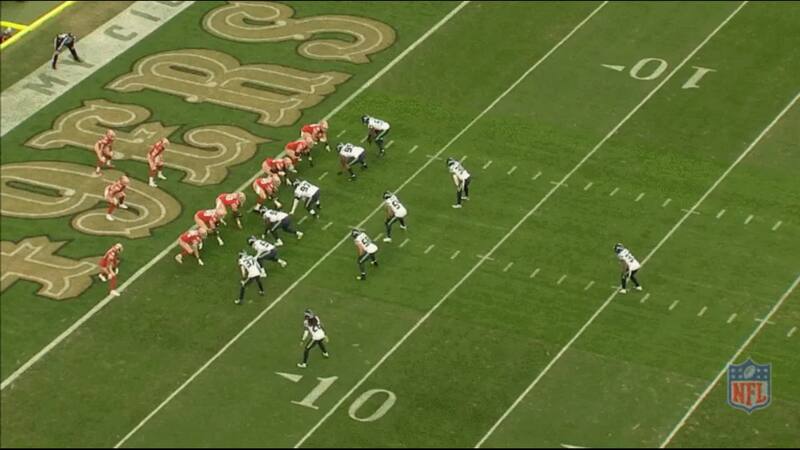 On another blitz pick-up, Seattle disguised its rush pre-snap before blitzing from the opposite side. This can be overwhelming for a young quarterback but Mullens again displayed a great awareness and quick processing ability to get a throw off to Kendrick Bourne over the middle. Seattle hides its fire zone blitz with a seven man box. 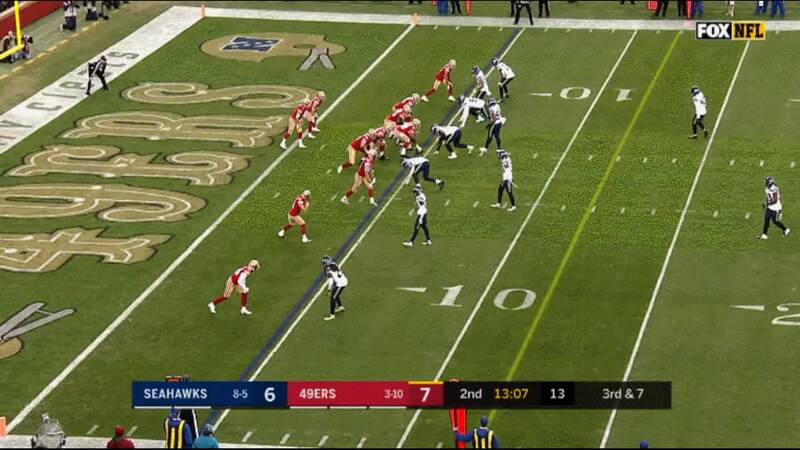 The 49ers have seven in pass protection but Kittle checks the rush before heading to the flat, leaving six Seattle defenders on the left drop off to the underneath zones vacated by their blitz from the defense's right. The offensive line gets caught blocking one rusher to its right, leaving four rushing at three to the offense's left. Mullens accounts for the free rusher, Shalom Luani (No. 24), by adjusting his drop back to the right to give him a half second more to get the throw off. Bourne hits the zone and sits down between four defenders as Mullens releases and it would've converted the down series but the pass went right through Bourne's hands. The biggest bright line separating Mullens from Beathard is Mullens' quick processing ability. On a couple of early throws in his first start against the Raiders, Mullens was late seeing the deep out routes open and throwing with anticipation. Since then, he has drastically improved his timing and anticipation by recognizing coverages and blitzes. 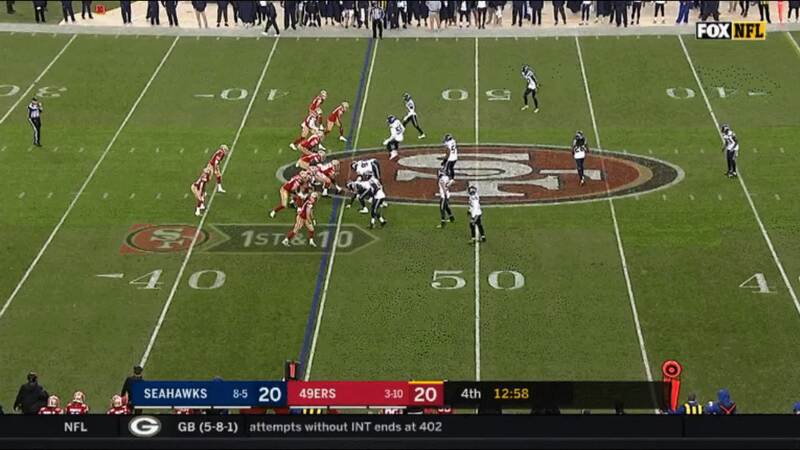 Here on this play, Mullens sees the Seahawks are preparing to blitz on a third-and-7 with the 49ers on their own five yard line and Mullens standing on his own goal line. The Seahawks blitz from the slot over receiver Trent Taylor who automatically becomes the hot receiver. The protection holds long enough for Mullens to take his regular drop back. As he hits the top of his drop against a six-man blitz, he rifles a pass from the far hash to the opposite side where he hits Taylor for an 8-yard gain. The ability to recognize the blitz and adjust his drop back to the timing of the route is a dramatic improvement over a six week period. What makes this throw particularly impressive as well is that the angle of the throw to Taylor on the sideline is a tougher, flatter trajectory than some of his deep out misses early on. Mullens doesn't have the best arm talent, which we normally characterize as a combination of velocity, touch, and timing. He lacks the velocity to hit tight windows late in a down but makes up for it with timing and and understanding of leverage combined with some nice touch. 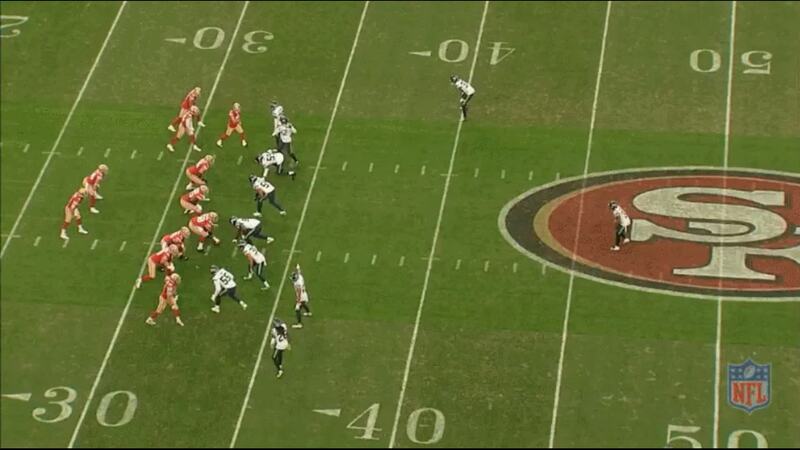 This was apparent on two deep passes he threw against the Seattle defense. Though he did miss two deep passes to Kittle on overthrows, he still displayed some good awareness of defender leverage on this throw to Pettis down the sideline. Pettis is the middle slot in a trips formation to the right after Kittle motions over from the left. He releases down field outside on the defender on a slot fade route, putting distance between himself and the safety coming over the top, essentially on an island with the defender on his inside hip. Mullens sees the leverage and throws the ball over the top between the numbers and sideline, throwing Pettis open with a perfect pass away from both defenders. Here on this play below, he demonstrated again that he understood where to place the pass given the defender leverage. Kittle takes an outside release on the corner down the numbers but the corner stays shaded over the top to his inside. Mullens, anticipating the coverage, places the pass on Kittle's back shoulder. The momentum of stopping to catch a back shoulder pass generally catches a defender off guard in such a way that the only way to disrupt the play is to take a risk and try to recover by trying to disrupt the timing of the catch. The defender on Kittle locks him up by tugging and grabbing at Kittle's jersey all the way down field to try and prevent Kittle from catching it. Mullens gives Kittle a chance but is unable to come down with the ball, though still drawing a flag. It's still unclear how the league's quarterback needy teams view the former practice squad turned starter but it's safe to assume that some teams will come calling in the offseason offering to trade for the quarterback. One way he can up his value is throwing with a little more anticipation and taking chances to hit tight coverage throws. On a third-and-4 situation inside the red zone late in the second half, Mullens showed where he needs to take the next step and anticipate windows of opportunity to throw into. 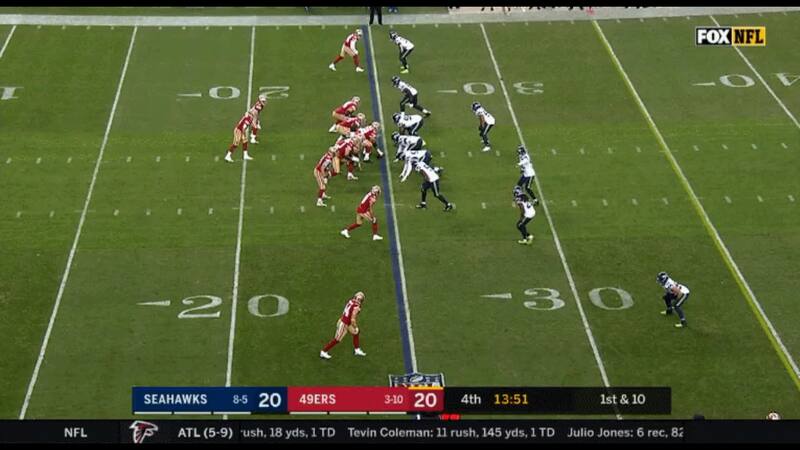 The 49ers spread the Seahawks out wide with an empty shotgun spread 3x2 formation running what Shanahan calls "squirrel" to the left. Mullens initially drops back looking right to Pettis but comes off the progression back to Kendrick Bourne (No. 84) on the left. Bourne breaks in with the defender over the top but Mullens is late with the throw and can't fit it in while Bourne is coming back to the ball against man coverage. He showed here that he needs to improve reading the leverage/coverage of the defender in close quarters situations and hit the landmark on the throw where the receiver will be, not where he currently is. The pass is broken up by the defender. Had Mullens stayed on Pettis for a half second longer too, he could've hit Pettis as soon as he hit his out cut with a throw low and away from the defender over the top. He still has a lot to work on, but for now, the signs are encouraging heading into the final two weeks of the season. The 49ers have won the last two of three games and face a formidable Bears team led by Khalil Mack and former 49ers defensive coordinator vic Fangio. Beating the Seahawks, a team destined for the playoffs, was hopefully the catalyst this young team needs going forward. Wins over the Broncos and Seahawks showed that the team is learning how to close out close games, and against two very good defenses in the last two weeks. Shanahan and Mullens can further cement a positive outlook going forward by getting a win against one of the NFC's best team in week 16, and the current number one defense.